The undefeated world heavyweight champion from Brockton stopped Archie Moore in the ninth round at Yankee Stadium on Sept. 21, 1955 to improve to 49-0, then called it a career seven months later at the age of 32. BROCKTON – Sixty years ago tonight, he stepped into a boxing ring for the 49th time in a perfect professional career. 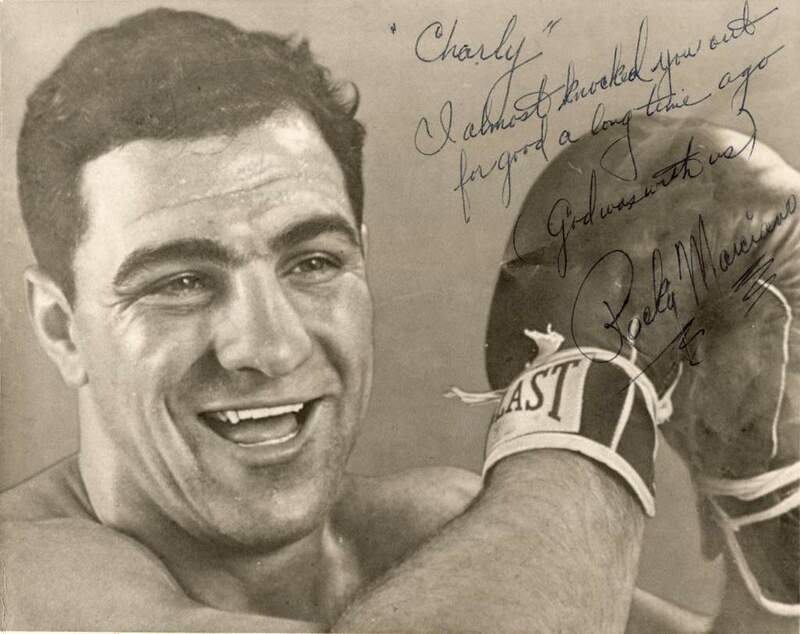 Undefeated Rocky Marciano of Brockton put his heavyweight championship on the line that night against light heavyweight champion Archie Moore with 61,574 fans on hand at Yankee Stadium. It wasn’t until seven months later when it was learned that that night in the Bronx would be the final fight for Marciano. He took care of the 38-year-old Moore, winning by knockout at 1:19 of the ninth round, and the wait began to see what Marciano would be doing next. Instead of chasing a 50th straight victory, however, Marciano announced his retirement from the sport at the age of 32 on April 27, 1956. That win over Moore six decades ago this evening proved to be the final chapter in a legendary run for Marciano. According to his younger brother, Peter Marciano, the champion didn’t feel there were any worthy challengers around to keep him going. “He gave anybody and everybody who was worthy of the title a chance,” said Peter Marciano, who attended the fight 60 years ago. “He sidestepped no one. He really didn’t feel there was anybody around at that time that could give him a good fight. The only guy around was Floyd Patterson, who was kind of before his prime. “I think Rocky really needed someone to push him, to motivate him to get into the gym and work as hard as he did. I don’t really know if he had the motivation to get in there and do what he had to do. Marciano was a 4-1 favorite against Moore, who had 144 pro fights to his credit, and he earned about $482,000 for the bout, according to boxrec.com. In addition to the large crowd at Yankee Stadium, there were 320,000 fans watching on Theatre Network Television in 92 cities. Moore, trying to become the first light heavyweight to win the heavyweight crown, had constantly asked Marciano for the matchup. Once they got into the ring, the aging Moore stunned Marciano by knocking the champion down in the second round. Marciano was down for only a few seconds in just the second knockdown of his career. Said Peter Marciano: “In the second round, he got hit with a short right cross and he went down for the count of three or four. He really wasn’t hurt. Marciano recovered from that knockdown and was in control of the fight the rest of the way, dropping Moore three times. He was ahead on all three scorecards, including 7-1 on one, when the fight was stopped in the ninth round. As he spoke with reporters that night at the home of the New York Yankees, Marciano was asked about what was going to happen now that he had won 49 in a row with the conquest of Moore. “There is a lot of pressure from my family for me to retire,” said Marciano. “My mother wants me to quit, so does my dad and my wife. It has been a pretty bad ordeal for them. But after the fall and the winter, Marciano called it quits in the spring, walking away with his perfect record intact. “Now that I think back, I kind of feel that I had a good feeling that (the fight against Moore) might be it,” said Peter Marciano. “I think he could have taken on two, three, four more guys and had a fairly easy go at it. I just don’t think Rocky was built that way. Rocky kind of liked the idea of somebody giving him a challenge. Jim Fenton may be reached at jfenton@enterprisenews.com.